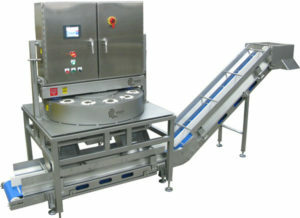 The Maestro XL utilizes the same design concepts as the Maestro SD, but the carousel size is increased to accommodate larger products, such as peppers. The pushers are powered by a combination of servo motors and linear actuators, which provides for precise control of the product coring and cutting. 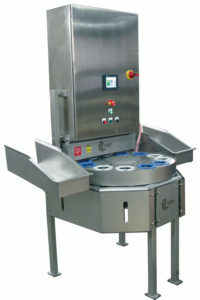 The product is placed in the carousel and is held by an upper and lower set of food grade silicon fingers. The product indexes to the cutting station where it is pushed through the blade. Cores and product are discharged separately onto the conveyor belt, which has a divider down the center. 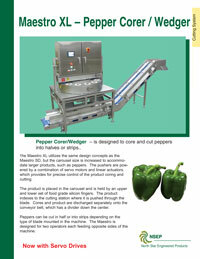 Peppers can be cut in half or into strips depending on the type of blade mounted in the machine. 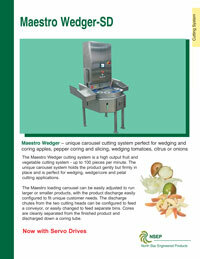 The Maestro is designed for two operators each feeding opposite sides of the machine.